There's a hot new twist on hummus--taking it from the traditionally savory dip that it is, to a sweet one. And while I was dubious at first (and at second: my initial attempt at home was less than delicious), I figured we'd dive in and see if we couldn't create an afterschool dip that everyone adored. Took a can of chickpeas, blended them into a Vanilla Bean Hummus, sweetened with pure maple syrup (hallo thar: vegan recipe). Then swirled all that all with a hefty scoop of chocolate peanut butter. 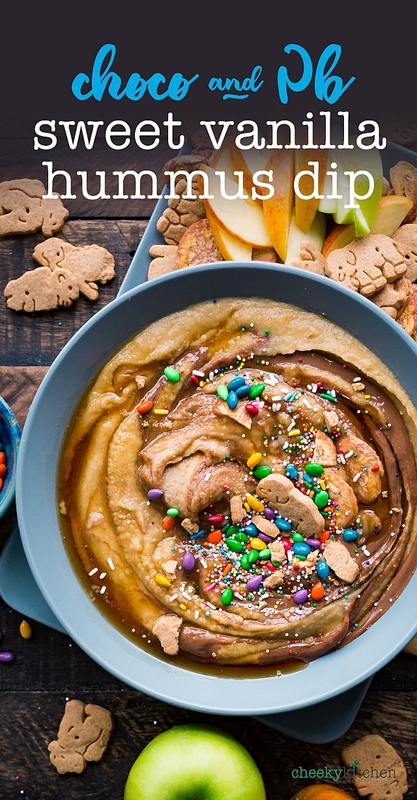 The kids came home from school and I, all sorts of nonchalant, welcomed them with this big, colorful, sprinkle-topped bowl with a "hey guys, cookie dough dip". And they were none the wiser. Just dived right in (dove right in?) to that bowl of beans. Which they thought was some sort of wicked-wonderful batter. Apples and gluten-free animal crackers were thusly devoured. And that is how, after one seriously dubious start, we fell in love with Sweet Hummus. Grab your apples. We think you're 'bout to love this one, too. In a blender or food processor, puree garbanzo beans, syrup, vanilla past, sea salt, coconut butter and almond extract together. Spoon into a large bowl. Microwave chocolate peanut butter until softened (about 20-30 seconds). Swirl into hummus. Serve with apples, animal or graham crackers, plantain chips and sunflower seed candies or naturally colored chocolate candies.